Does your cat like to climb? My cats have always loved to leap from one high place to another. They love to perch up above everything, surveying everything below. Before cat trees were so popular, they would leap on top of bookshelves, the fireplace mantel, or the piano. They would also claw the furniture and shred the carpet. Now, with a cat tree, they prefer to sharpen their claws on the carpet in the cat tree and there’s less leaping around the house. Make sure the cat tree is sturdy. You can do this by looking at the way it’s built, starting with the base. Wooden cat trees covered with fabric are more durable and long-lasting than a cat tree that is made of most other materials. The base of the tree should be wide and stable. It should not wobble or your cat can get spooked and she won’t use it. The tree should also be solid and heavy enough to support your cat’s weight when she jumps and lands. Remember that some cats like to run and jump which increases the weight the cat puts on the tree when she lands. The cat tree needs to be tall enough to please your cat. If it’s not very tall, your cat can’t really jump or exercise very much. But, if the tree is too tall or not supported well, your cat could knock it over when she runs and jumps on it. So, make sure the tree is tall enough and well-supported. If your cat enjoys scratching, make sure the tree has a durable fabric. 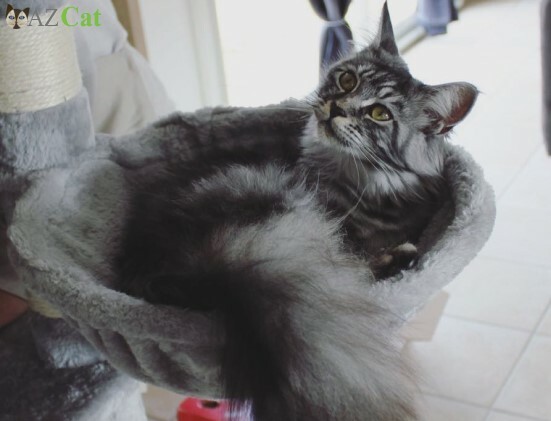 Carpet and sisal are popular materials for cat trees, especially on poles where cats like to scratch. Choose a cat tree that has “extras” your cat will enjoy. Some cat trees have kitty condos. Others have hammocks and perches. Depending on your budget, try to include as many extras as you can that your cat will find appealing. Finally, if you have multiple cats or if your cat is extra large, look for a cat tree that can accommodate your situation. Two or three cats leaping on a cat tree or a hefty cat jumping on a tree could send the cat tree crashing. It’s best to choose a cat tree that’s made for your cat family.